When we human beings experience deeply painful setbacks in life when trying to cope with and solve our problems, and when our hopes are met with disappointment, we face the challenge of letting those things either “make or break” us. To thoroughly move forward through the experience to gain true wisdom from it, we need to understand what happened to us, why it happened, and who owns responsibility for causes that may have contributed to the disappointing outcome. When those who fully intended to help us or the systems or tools used result in failure, our healing becomes so much more complicated because of those good motives. Working through these challenges while taking responsibility for our own role in the process requires courageous soul searching. When this process involves our beliefs about spirituality and religion, they add another level of significance and burden to our healing work. Many people shrink back from these challenges, for they are not work for the faint of heart, though we often find ourselves in that very state because of what we've already traversed. When I encountered John Weaver, I was encouraged by his determination to not only find meaning in his experience which I see him working through with courageous honesty, but also with his desire to use it to contribute something constructive to those with whom he identifies and empathizes. Though we've arrived at different conclusions about many spiritual matters, I was that much more honored by his gracious and respectful attitude towards me and other people of faith. I want to thank Cynthia for inviting me to post on her blog. My name is John Weaver. I grew up an evangelical. Eventually, due to my experiences with biblical counseling, I ended up leaving the evangelical movement. The biblical counseling movement in a very real way destroyed my faith, because I came to believe there was something intrinsically wrong with having a psychiatric diagnosis, even one as relatively benign as my own. 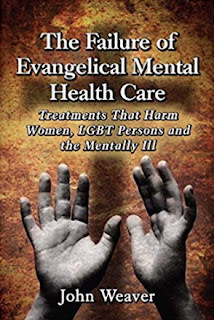 In many ways, the position of mentally ill and sexually traumatized people within the evangelical church is not much better than that of LGBT individuals, which is why I have promoted the need for tactical alliances between these groups, regardless of their potential individual differences in belief. What are my biggest concerns with the biblical counseling movement? I wish I had time to go into extended detail here, but I must be brief. My first major concern is that the biblical counseling movement’s commitment to the idea that there can only be physical (a.k.a. bodily or brain disorders), not mental disorders. There are a number of problems with this idea. The first problem, which the movement acknowledges, is that the biblical counseling movement assumes that there is a non-physical mind as well as a brain. This is, to say the least, a controversial view in mainstream science. While there are a few scientists who believe that mind is separate from the brain, there are a growing number of scientists who believe all the capabilities we associate with the mind actually are solely bodily (a friend of mine who has a PhD in Computer Science and works as full time faculty at a major state college is even blunter in his assessment: According to him, the evangelical idea of a non-physical mind separate from the brain distorts mainstream science where the mind is an emergent property of the brain. In other words, separating mind from body is for him an extremely scientifically dubious distinction). There is, in short, no independent willing part of human existence that is not directly connected to our biological makeup. The biblical counseling movement rejects this idea because it fears that such a monistic, mechanistic view of the body leaves no room for the soul. In my opinion, they are quite possibly correct there, but in science, unlike in the evangelical church today, what is valued is scientifically verifiable truth. But an even more fundamental problem is that one does not typically hear biblical counselors nouthetically confronting people who have migraines, headaches, or who experience physical pain without a discernible biological cause. How does one empirically prove that a headache is biological and “real,” as opposed to a mental health condition like schizophrenia or bipolar disorder? Why does the biblical counseling movement seem to excuse headache-sufferers, while condemning the mentally ill? We have historical evidence of most of the major psychiatric disorders or variants thereof – schizophrenia, bipolar, chronic depression, and obsessive compulsive disorder in particular – having existed for many centuries before our own time, which makes it likely that these disorders are either biological in origin or products of environmental influence beyond the individual’s control. Obviously, headaches have been around for a long time as well. Why then do almost no biblical counselors (except possibly Robert Smith) seem to be aware of the potential contradiction of nouthetically confronting the mentally ill, but not those with headaches? Indeed, I am all aghast at the possible uses of nouthetic confrontation against those taking anesthetics, since in many (though not all) cases pain itself does not seem to be a measurable physical phenomena (science is beginning to change on that, as well, which opens up a whole new can of worms for biblical counselors. Was pain a sin until we could measure it?). The biblical counseling movement’s response to this problem – as far as there has been one – is to argue that headaches likely have a biological cause, whereas mental illness (here they followed Thomas Szasz) represents a social construct used to mask socially irresponsible behavior. The problem with Szaszian thinking here is that it’s definition of mental illness is based on bodily lesion: If there is not a bodily lesion, the patient is presumed to be malingering and thus Szasz distinguishes between “true” illness and “false” illnesses. This puts Szasz however, and the biblical counseling movement, in a very deep hole. (Martin Roth Schizophrenia and The Theories of Thomas Szasz , British Journal of Psychiatry  318). Roth points out, for instance, that under Szasz’s criteria, Parkinson’s would not have been a real disease at the time of its discovery, but malingering, because until shortly before World War I the physical lesions associated with the disease were unknown. Suddenly Parkinson’s patients stopped faking their illness and became physically ill, even though in reality there condition had not changed, only the proof for its existence. One can only thank the heavens (including myself, a nominal non-believer) that Jay Adams and David Powlison were not alive in the 1800’s to nouthetically confront Parkinson’s patients. These problems are basic ground level problems with Szaszian theory that have been pointed out for decades, but the biblical counseling movement, like the academic left, ignores them, because their own theories of mental illness are based (following Szasz) on both a “lesion only”-oriented idea of illness, and a social constructionist view of science. The latter view is not totally wrong, but has critical shortcomings in the way lovers of Laing, Foucault, Powlison, and Adams apply it. The former idea, quite simply is considered outmoded by mainstream science. But even if one accepts the idea that mental illness is a misnomer – the central argument of biblical counseling and Szasz – one is left with an even worse problem, because Szaszian theory, by Szasz’s own admission, is predicated on the idea that there can be no such thing as mental illness. In other words, such illness is impossible in Szasz’s system. The only logical conclusion to draw from this concept, however, is that there is no such thing as mental health either. Both ideas, for a Szasian are semiotic (roughly speaking, linguistic) mistakes, because they ascribe physical categories (health, illness) to mental phenomena, and in Szasz’s thought, as in Adams’s, minds cannot be sick. Therefore, if Szasz and Adams are to be philosophically consistent – they must not only argue that minds cannot be sick, but that minds cannot be well either. Otherwise, the whole normalizing project that anti-psychiatry sets up is simply smoke and mirrors, arbitrarily defining only certain people – significantly, often unpopular groups – as social malingers, when a philosophically consistent Szaszian system would have to argue that the whole idea of mental illness vs. mental health is totally arbitrary. As I.M. Brassington suggests, there is arguably much to recommend in getting rid of the category of “mental illness,” but it seems hopelessly pointless to do so without getting rid of the category of “mental health” as well (I.M. Brassington, Actions, causes and psychiatry: A reply to Szasz 120-124). Finally, I would close by pointing out what is rapidly becoming my least favorite argument on the part of the biblical counseling movement: That the charges against Sovereign Grace Ministries are the same as those leveled by the alleged perpetrators of Satanic Ritual Abuse (SRA) back in the 80’s, which (as is well known) turned out to be absurd [alleging that the abuse memories were false “recovered memories”]. I agree with SGM supporters in their questioning of concepts like recovered memory, and I myself am rather skeptical of the whole diagnosis of DID\MPD that has come along with it (a skepticism that is becoming increasingly prevalent in academia, especially by those who are not committed to the SRA abuse model). I wish nothing but the best for my former co-religionists, and I still retain a loyalty to evangelicalism, as a class-culture, if not a religious movement. But I want to see the evangelical church be the best that it can be. The biblical counseling movement does not represent that best. And it never will.